White space is for the projection of one's soul. On a snow-capped mountain, your mind expands to the limits of your imagination. Cities can have white space, of great extent, scale and prospect. 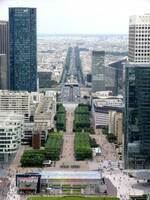 The whitest space in Paris is around la Grand Arche at La Défense (Figure 16.5). The government quarter of Washington DC is a white space.